Who wouldn’t want to buy their own homes or perhaps rent a property? Buying a home or renting a property can be too costly that paying it in bulk seems impossible. Good thing home loans or mortgage amortizations nowadays are not that hard to find. When you say amortization, it means a legal agreement in which a person borrows money to buy a property, such as a house, and pays back the money over a period of years. It allows you to purchase that dream house or apartment by paying it through installment. Mortgage loans are secured with the borrowers property, or what is called a collateral. 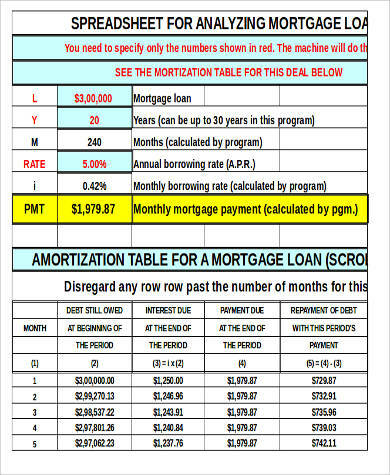 Below are some mortgage amortization samples. 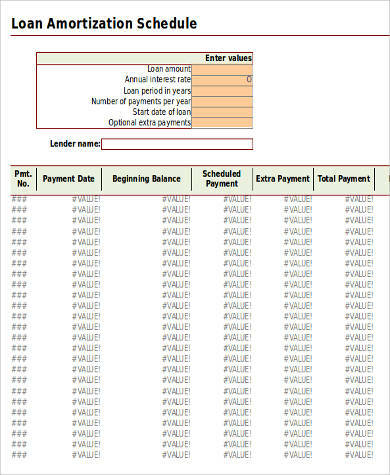 You may also want to check our Sample Timecard Calculators. Fixed Rate Mortgage (FRM) – This mortgage type is a fully amortizing loan wherein the interest rate of the mortgage stays the same or is fixed for a number of years. A fixed rate funding is hard to obtain and is expensive. 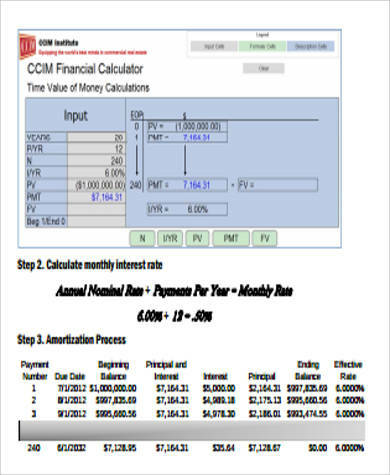 It is characterized by a principal amount, the interest rate, the loan frequency, and the duration. One of the advantages of this type of mortgage is that the interest payments and the loan duration stays fixed from beginning to end. This mortgage typically lasts for two to five years. 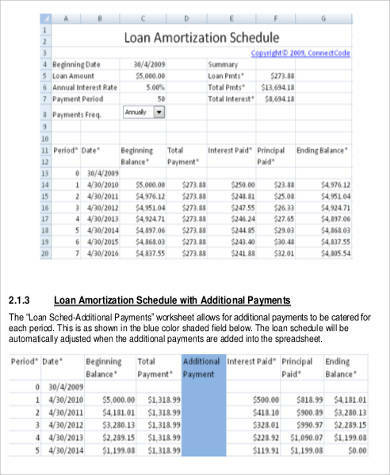 This type is often referred to as vanilla wafer mortgage loan.You may also see Loan Amortization Schedule Excel Samples to know more about amortization schedules. Variable Rate Mortgage (VRM) – The interest rates change or fluctuate over time based on a certain index. 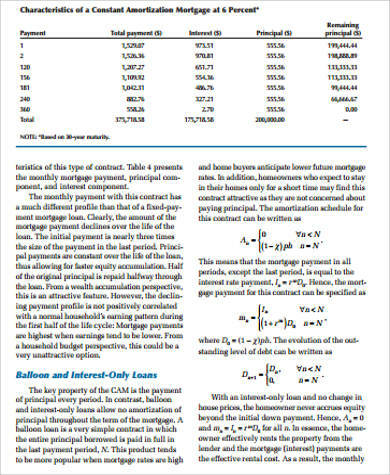 It is widely used because part of the interest rate risk of this mortgage is transferred from the lender to the borrower. Other terms used are adjustable rate mortgage (ARM), tracker mortgage or floating rate mortgage. Cars, jewelries appliances, etc., are properties that can be mortgaged. But the most common are real estate properties. They are often used to secure the mortgage loan as a collateral. A lot of lending institutions including banks offer mortgages, so taking advantage of it is not hard to find. Some mortgage rates change anytime within the loan. You are likely to pay more than what you borrowed because mortgages come with interest rates. There are mortgages that will give you the freedom to leave at any time. Some mortgages start with cheaper monthly rates. 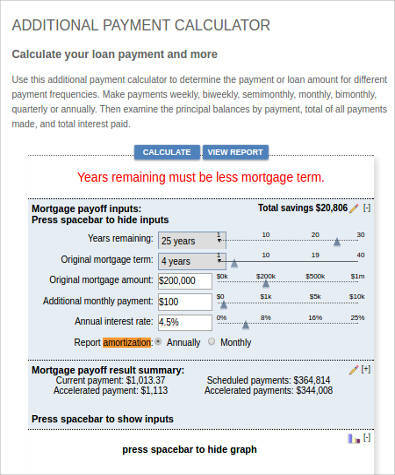 With fixed rate mortgages, your monthly mortgage payments are predictable. Owning a home or property is made affordable by a mortgage. It is a cost-effective way of buying. Your mortgage interest rates tend to be lower than any form of borrowing or lending because your loan is secured by your property as a collateral. If you leave a deal early, you may incur charges or penalty fees. You should watch out for them. You are likely to pay more than what you borrowed because of the interest rates. Now you don’t have to think twice about getting that dream house or property. 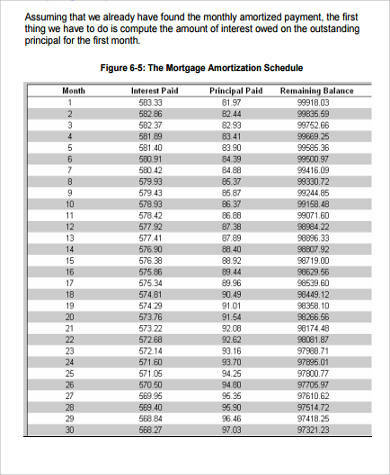 You just need to know more about mortgage amortization. 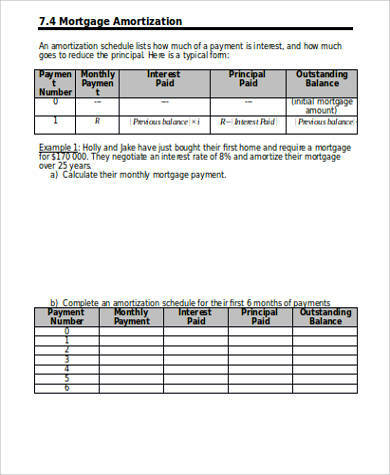 And what better way to do that is to download our amortization mortgage samples, which works hand in hand with our Payment Calculator Mortgage Samples. What are you waiting for? Download now!